Driven by southwesterly winter winds, dust from the White Sands dune field in New Mexico rises thousands of feet from the valley floor and drifts over the snowy peaks of the Sacramento Mountains.White Sands National Monument lies in the 50 kilometer (31 mile) wide Tularosa valley, between the dark rocks and forested slopes of the Sacramento Mountains and the San Andres Mountains. The lower and warmer ridge line of the San Andres was without snow on the day this photograph was taken. The striking black lava flows of the Carrizozo lava field also occupy the valley floor (image top). The darker tones of agriculture in the Rio Grande floodplain can be seen along the left margin of the image. The dust plumes in this astronaut photograph stretch more than 120 kilometers (74 miles). The vigor of the winds also can be judged from the fact that they are lifting dust particles from the valley floor to more than 1200 meters over the mountains. The winds channel the dust through a low point in the mountains, about 800 meters lower than the ridge crests to north and south (image right). The Moderate Resolution Imaging Spectroradiometer (MODIS) on NASA’s Aqua satellite also captured a wider, regional view of the plumes on the same day. In most parts of the world, blowing dust is some shade of light brown or red. 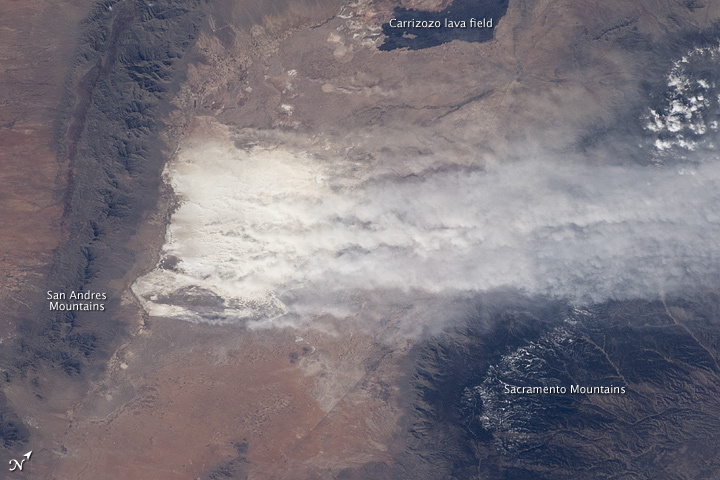 In this image, two different colors can be seen in the dust plume: redder dust from the hillsides north of White Sands and white dust from the dune field itself. The sand dunes of this national monument are white because they are composed of gypsum, a relatively rare dune-forming mineral. The gypsum is deposited during the evaporation of mineral-rich waters in an ephemeral lake in the western part of the Monument. Erosion of the deposits, together with wind transport, provides the granular material for the dunes. The dunes’ brilliance, especially contrasted against the nearby dark mountain slopes, makes them easily identifiable to orbiting astronauts. The white speck of the dunes was even visible to astronaut crews looking back at Earth on the way to the Moon. But this is also White Sands Military Testing range where many nuke weapons have been blown up above ground with fragments scattered wide around this area. White Sands Missile Range (WSMR) is a rocket range of almost 3,200 square miles (8,300 km2) in parts of five counties in southern New Mexico. The largest military installation in the United States, WSMR includes the Oscura Range and the WSMR Otera Mesa bombing range. WSMR and the 600,000-acre (2,400 km2) McGregor Range Complex at Fort Bliss to the south, form a contiguous swath of territory for military testing. 1941 – 13 April: Alamogordo Army Airfield established. 1941 – December: Public land grazing leases were canceled on the newly formed Alamogordo Bombing and Gunnery Range. 1942 – July: Robert Goddard transferred his rocket research group from Roswell, New Mexico to Annapolis, Maryland. 1944 – November: Trinity (nuclear test) site was selected. 1945 – 25 June: Drilling of water wells began construction of WSPG facilities. 1945 – 16 July: The first atomic bomb was detonated at the Trinity test site. 1945 – September: Launch Area 1 Army blockhouse (Launch Complex 33) was completed. 1945 – November: General Electric employees began to identify, sort, and reassemble V-2 rocket components in Building 1538, designated as Assembly Building 1. 1946 – January: German rocket scientists of Operation Paperclip arrived at Fort Bliss to assist V-2 rocket testing program. 1948 – 14 January: Alamogordo Army Airfield officially renamed Holloman Air Force Base. 1949: German rocket scientists transferred from Fort Bliss to Redstone Arsenal. 1953 – June: USS Desert Ship (LLS-1) (Launch Complex 35) was built to test the Navy RIM-8 Talos missile. 1958 – 1 May: White Sands Proving Ground officially renamed White Sands Missile Range. 1966 – 15 October: Trinity test site was listed on the National Register of Historic Places. 1985 – 3 October: White Sands V-2 Launching Site (Launch Complex 33) designated a National Historic Landmark. 2004: The American Institute of Aeronautics and Astronautics named the WSPG a Historic Aerospace Site. 2004 May: Refurbished Mittelwerk V-2 rocket #FZ04/20919 returned to the WSMR Museum after being taken to the Kansas Cosmosphere and Space Center in September 2002 for restoration. 2007 – 14 November: NASA and a handful of community representatives broke ground at the Launch Complex-32 site for the Orion Abort Flight Test Launch Complex. 1945, the Trinity explosion, 0.016 seconds after detonation. Operation Paperclip was the Office of Strategic Services (OSS) program used to recruit the scientists of Nazi Germany for employment by the United States in the aftermath of World War II (1939–45). It was conducted by the Joint Intelligence Objectives Agency (JIOA), and in the context of the burgeoning Soviet–American Cold War (1945–91); one purpose of Operation Paperclip was to deny German scientific knowledge and expertise to the USSR and the UK and to (divided) Germany itself. Although the JIOA’s recruitment of German scientists began after the European Allied victory (8 May 1945), US PresidentHarry Truman did not formally order the execution of Operation Paperclip until August 1945. Truman’s order expressly excluded anyone found “to have been a member of the Nazi Party, and more than a nominal participant in its activities, or an active supporter of Nazi militarism.” However, those restrictions would have rendered ineligible most of the leading scientists the JIOA had identified for recruitment, among them rocket scientists Wernher von Braun and Arthur Rudolph, and the physician Hubertus Strughold, each earlier classified as a “menace to the security of the Allied Forces”. To circumvent President Truman’s anti-Nazi order, and the Allied Potsdam and Yalta agreements, the JIOA worked independently to create false employment and political biographies for the scientists. The JIOA also expunged from the public record the scientists’ Nazi Party memberships and régime affiliations. Once “bleached” of their Nazism, the US government granted the scientists security clearance to work in the United States. Paperclip, the project’s operational name, derived from the paperclips used to attach the scientists’ new political personae to their “US Government Scientist” JIOA personnel files.